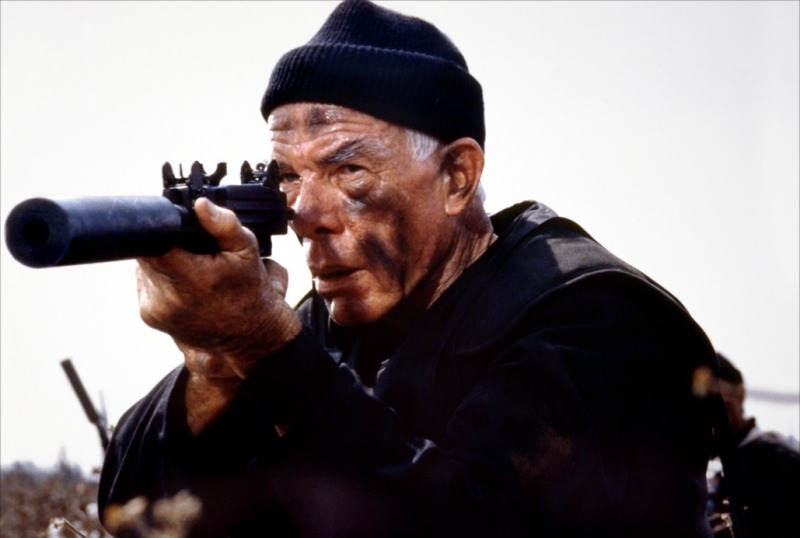 One of the more ambitious Cannon Film efforts, The Delta Force teams veteran Lee Marvin with expressionless Chuck Norris, throws a lot of once-famous names at the screen, and achieves some engagement by taking its time to develop a story and a dose of drama prior to the machine guns opening up. But once the shooting starts, it quickly disintegrates into the mind-numbing excesses that made most Golan - Globus productions infamously bad. Two terrorists led by Abdul Rifi (Robert Forster) hijack an American Travelways flight from Athens. The plane is diverted to Lebanon, where terrorist reinforcements arrive to bolster the hijackers. The Jewish passengers (including Martin Balsam and Joey Bishop) are taken off the plane and held captive in Beirut prison cells. Also on board are three US Navy sailors who are singled out for rough treatment, with one eventually killed. Throughout, flight attendant Ingrid (Hanna Schygulla) does her best to calm the tense situation and avoid further violence. After some traipsing across the Middle East, the plane returns to Lebanon and all the hostages are taken off the aircraft and stashed in a Beirut terrorist stronghold. The elite counter-terrorist Delta Force, under the command of Colonel Alexander (Marvin) and Major McCoy (Norris) is dispatched to mount a rescue. Alexander and McCoy were part of the shambolic 1980 operation that spectacularly failed in an attempt to extract the American embassy hostages in Iran. Determined to make amends, the Delta Force launches a daring mission within Beirut to rescue the hostages and retrieve the hijacked plane. Inspired by the true 1985 hijacking of a TWA airliner (the real Delta Force was readied but not deployed), The Delta Force may have represented the peak of achievement for Menahem Golan and Yoram Globus. Directed by Golan, it was the first major Cannon production filmed at the GG Israel Studios in Jerusalem, and it also turned out to be the only high profile film to make use of the facility before the company collapsed. Shelley Winters, George Kennedy, Robert Vaughn, Bo Svenson, and Susan Strasberg are among the once somewhat famous actors who get smallish parts in The Delta Force, and despite triggering a game of spot the has-been, they collectively add interest to the film. The movie does exhibit an increased level of professionalism and care. Scenes and characters are given appropriate time to breathe and develop, and the earlier part of the hijacking saga hits some promising notes in building the on-board tension between assailants and victims. But the final third of the film retreats to the Neanderthal cave where most of Cannon's action films dwell. 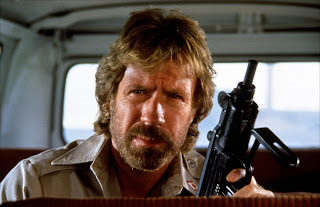 Norris' McCoy character in particular contributes to an elevated amount of nonsense, killing hordes of terrorists on a motorcycle filled with an endless supply of lethal rockets, and an uncanny ability to never miss a single target. But saddest of all is Lee Marvin's frail appearance in The Delta Force. In his farewell performance, he undoubtedly elevates the movie with an injection of distinguished talent and sheer presence. But he is also undeniably fragile and too old for the role, going through the motions in almost visible discomfort. The Delta Force is not without its point of interest, but the production's limited tool set confines the experience to the cramped economy class, near the dank rear of the plane.